The Chicago Red Stars looked ready to leave New Jersey with all three points, but the back-to-back NWSL Player of Month Samantha Kerr thought otherwise. Kerr scored her 10th goal of the season to equalize in the 90th minute for Sky Blue FC, and earn the point at Yurcak Field in a 2-2 draw. The Chicago Red Stars kicked off the scoring, with an early goal from forward Sofia Huerta in the 4th minute. Christen Press provided the assist after beating Sky Blue defender Christie Pearce to a ball in the midfield. Press would score her own in the 26th minute to put the Red Stars up by two on the road. Chicago defender Casey Short faced pressure from Sky Blue’s Kelley O’Hara, and pushed the ball back to Vanessa DiBernardo outside the box. 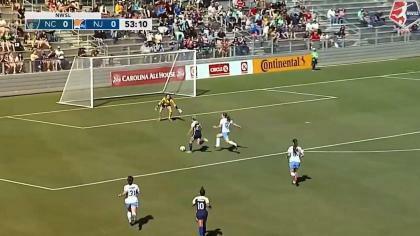 DiBernardo sent the ball in with her right foot, where Press split her defenders and chested the ball down for a finish past goalkeeper Kailen Sheridan. Sky Blue FC didn’t need to wait too long to start on their comeback. 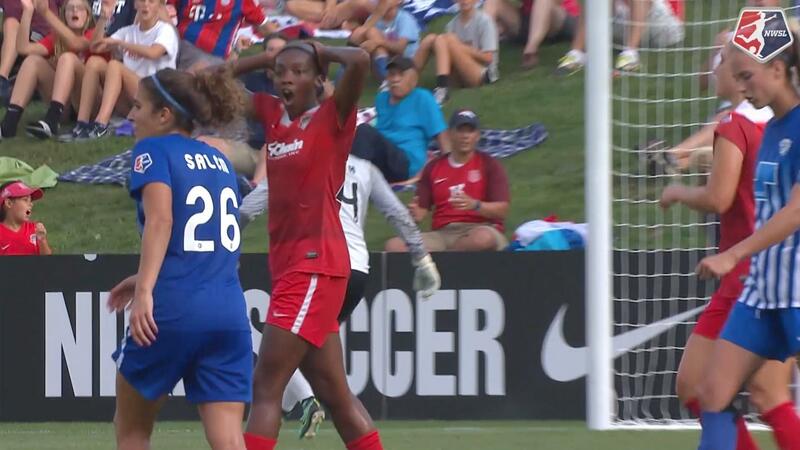 Forward Maya Hayes got a second-chance opportunity right in front of goal as Chicago’s Alyssa Naeher came out to block her shot but couldn’t fully control the ball. Both Naeher and Sheridan were busy on Saturday night at Yurcak. While both conceded two goals, Sheridan came up with seven saves, Naeher with six. Sheridan in particular was crucial during the second half, as she came up with stops against both of Chicago’s goal scorers Huerta and Press to keep Sky Blue FC in the hunt. 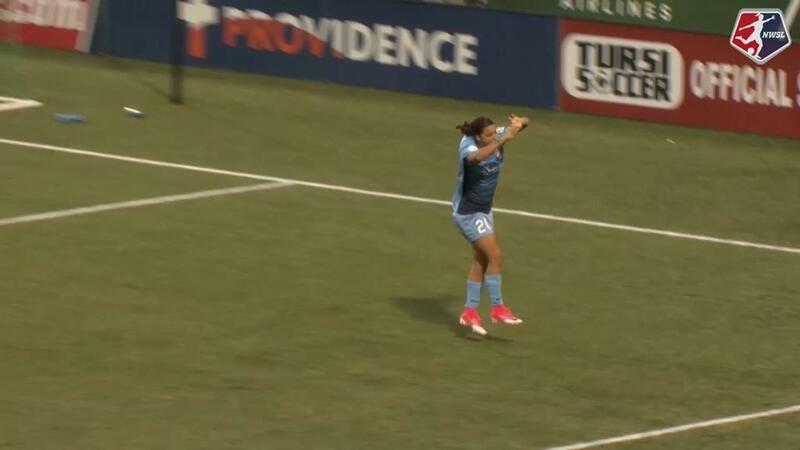 But who else could it be for the equalizer but Sam Kerr? This time, midfielder Sarah Killion provided the aerial service from the right wing as Kerr drifted a step behind Red Stars midfielder Julie Ertz. And once again, with her team needing a huge goal, Kerr provided the finish with her head. Chicago, after four games on the road, finally returns home to Toyota Park next Saturday. They host the Orlando Pride, who will be brimming with confidence after a big 4-1 win over FC Kansas City this Saturday night. Sky Blue FC heads to the West Coast for a late game against Seattle Reign FC at 10:00 p.m. ET next Saturday, with the top of the table almost in their sights. Match ends, Sky Blue 2, Chicago Red Stars 2. Second Half ends, Sky Blue 2, Chicago Red Stars 2. Hand ball by Taylor Lytle (Sky Blue). Substitution, Chicago Red Stars. Lauren Kaskie replaces Alyssa Mautz. Goal! Sky Blue 2, Chicago Red Stars 2. Samantha Kerr (Sky Blue) header from the centre of the box to the top left corner. Assisted by Sarah Killion with a cross. Attempt saved. McKenzie Meehan (Sky Blue) right footed shot from the centre of the box is saved in the bottom left corner. Assisted by Kelley O'Hara with a cross. Hand ball by Arin Gilliland (Chicago Red Stars). Offside, Sky Blue. McKenzie Meehan tries a through ball, but Leah Galton is caught offside. Kelley O'Hara (Sky Blue) is shown the yellow card for a bad foul. Substitution, Sky Blue. McKenzie Meehan replaces Maya Hayes. Attempt missed. Sofia Huerta (Chicago Red Stars) right footed shot from a difficult angle on the left misses to the left. Assisted by Vanessa Di Bernardo following a set piece situation. Taylor Comeau (Chicago Red Stars) wins a free kick in the attacking half. Attempt saved. Christen Press (Chicago Red Stars) left footed shot from the centre of the box is saved in the centre of the goal. Assisted by Vanessa Di Bernardo. Attempt missed. Christen Press (Chicago Red Stars) right footed shot from outside the box is too high from a direct free kick. Corner, Sky Blue. Conceded by Alyssa Mautz. Attempt blocked. Leah Galton (Sky Blue) left footed shot from the left side of the box is blocked. Assisted by Taylor Lytle. Hand ball by Christie Pearce (Sky Blue). Substitution, Sky Blue. Leah Galton replaces Kayla Mills. Attempt saved. Christen Press (Chicago Red Stars) left footed shot from the centre of the box is saved in the centre of the goal. Assisted by Danielle Colaprico with a through ball. Attempt missed. Alyssa Mautz (Chicago Red Stars) left footed shot from the centre of the box is close, but misses to the left. Assisted by Sofia Huerta. Attempt missed. Samantha Kerr (Sky Blue) left footed shot from the centre of the box is close, but misses the top right corner. Assisted by Taylor Lytle with a cross. Attempt saved. Alyssa Mautz (Chicago Red Stars) right footed shot from outside the box is saved in the bottom right corner. Assisted by Sofia Huerta. Attempt saved. Christen Press (Chicago Red Stars) left footed shot from the left side of the six yard box is saved in the centre of the goal. Assisted by Arin Gilliland. Vanessa Di Bernardo (Chicago Red Stars) wins a free kick on the left wing. Attempt blocked. Daphne Corboz (Sky Blue) left footed shot from outside the box is blocked. Assisted by Samantha Kerr. Substitution, Sky Blue. Raquel Rodríguez replaces Nikki Stanton. Attempt saved. Sofia Huerta (Chicago Red Stars) right footed shot from the right side of the box is saved in the centre of the goal. Assisted by Christen Press. Attempt missed. Taylor Comeau (Chicago Red Stars) right footed shot from outside the box is too high. Offside, Chicago Red Stars. Alyssa Mautz tries a through ball, but Vanessa Di Bernardo is caught offside. Maya Hayes (Sky Blue) wins a free kick on the right wing. Second Half begins Sky Blue 1, Chicago Red Stars 2. First Half ends, Sky Blue 1, Chicago Red Stars 2. Attempt missed. Daphne Corboz (Sky Blue) right footed shot from outside the box is too high. Assisted by Samantha Kerr following a set piece situation. Maya Hayes (Sky Blue) wins a free kick on the left wing. Sarah Killion (Sky Blue) hits the bar with a right footed shot from the centre of the box. Assisted by Samantha Kerr. Corner, Sky Blue. Conceded by Vanessa Di Bernardo. Corner, Sky Blue. Conceded by Julie Ertz. Corner, Sky Blue. Conceded by Alyssa Naeher. Attempt saved. Samantha Kerr (Sky Blue) right footed shot from the centre of the box is saved in the bottom right corner. Assisted by Daphne Corboz. Attempt saved. Samantha Kerr (Sky Blue) right footed shot from outside the box is saved in the bottom left corner. Assisted by Daphne Corboz. Goal! Sky Blue 1, Chicago Red Stars 2. Maya Hayes (Sky Blue) left footed shot from the centre of the box to the centre of the goal. Attempt saved. Maya Hayes (Sky Blue) left footed shot from the centre of the box is saved in the centre of the goal. Assisted by Taylor Lytle with a headed pass. Attempt saved. Daphne Corboz (Sky Blue) right footed shot from outside the box is saved in the bottom left corner. Kayla Mills (Sky Blue) wins a free kick in the attacking half. Goal! Sky Blue 0, Chicago Red Stars 2. Christen Press (Chicago Red Stars) left footed shot from the centre of the box to the bottom right corner. Assisted by Vanessa Di Bernardo with a through ball. Delay in match Samantha Johnson (Chicago Red Stars) because of an injury. Attempt missed. Christen Press (Chicago Red Stars) right footed shot from outside the box is close, but misses the top right corner from a direct free kick. Alyssa Mautz (Chicago Red Stars) wins a free kick in the attacking half. Attempt missed. Sofia Huerta (Chicago Red Stars) left footed shot from outside the box misses to the right. Attempt saved. Maya Hayes (Sky Blue) header from the centre of the box is saved in the centre of the goal. Daphne Corboz (Sky Blue) wins a free kick on the right wing. Goal! Sky Blue 0, Chicago Red Stars 1. Sofia Huerta (Chicago Red Stars) right footed shot from the centre of the box to the centre of the goal. Assisted by Christen Press. Attempt missed. Christen Press (Chicago Red Stars) left footed shot from the centre of the box is close, but misses the top left corner. Assisted by Sofia Huerta. Christen Press (Chicago Red Stars) wins a free kick in the attacking half.